Instagram hashtags are the bomb dot com. They are incredibly powerful and can help you get more likes, comments and followers. And… your photo can be reposted by other Instagrammers, on their account! So how to use Instagram hashtags correctly? What are some things you should do and shouldn’t do? Should you put your hashtags in the comments or caption? Where to find the right hashtags? 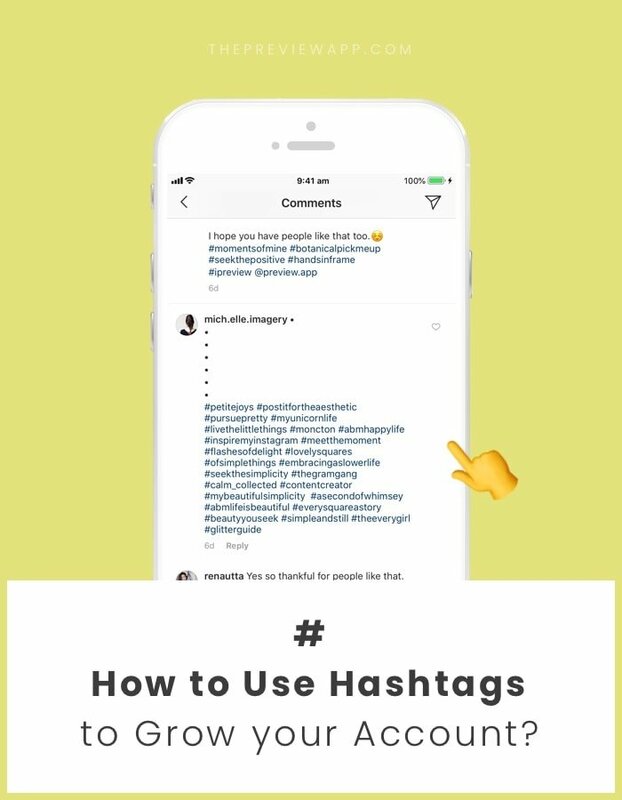 How to organize your hashtags? I’m going to tell you everything I know and do. Instagram allows you to use 30 hashtags on one post. Use all 30 hashtags. Each hashtag is an opportunity to get your post in front of people. The more hashtags you use, the more chances you have to be seen by different people. Check out this list of banned Instagram hashtags. I’m also showing you how you can check if the hashtags you are using are banned. Don’t use banned hashtags. Instagram is banning them for a reason. Don’t to send the wrong signal to Instagram and be associated with banned hashtags. Plus, if you use a banned hashtag your post won’t show up on the hashtag page. Ok, let’s get into it. Take a pen and paper (or your phone) if you want to write down the perfect hashtag for your account now… as you read the tips below. Always look at what hashtags people are using. You might find a gold nugget from time to time. Want to find Instagram hashtags by category? Community? Or country? You can use the Instagram Hashtag Finder in Preview app. Note: If you’re new, Preview app is an app to schedule, edit and plan your posts. When you prepare your caption you can also search for hashtags (within the app). This is the Hashtag Finder. Medium hashtags: have around a million posts, they are still general. Community hashtags: have less than 1 million posts. Micro-community hashtags: have less than 50,000 posts (sometimes even around 1,000 posts). I talked about Hashtag Communities our 2018 Instagram Trends Report. To recap: I said that the new trend is to join hashtag communities. People want to connect with people and support each other. That’s what Instagram is all about. A hashtag is a keyword. The Instagram algorithm loves keywords / hashtags. It links people who use the same hashtags together. 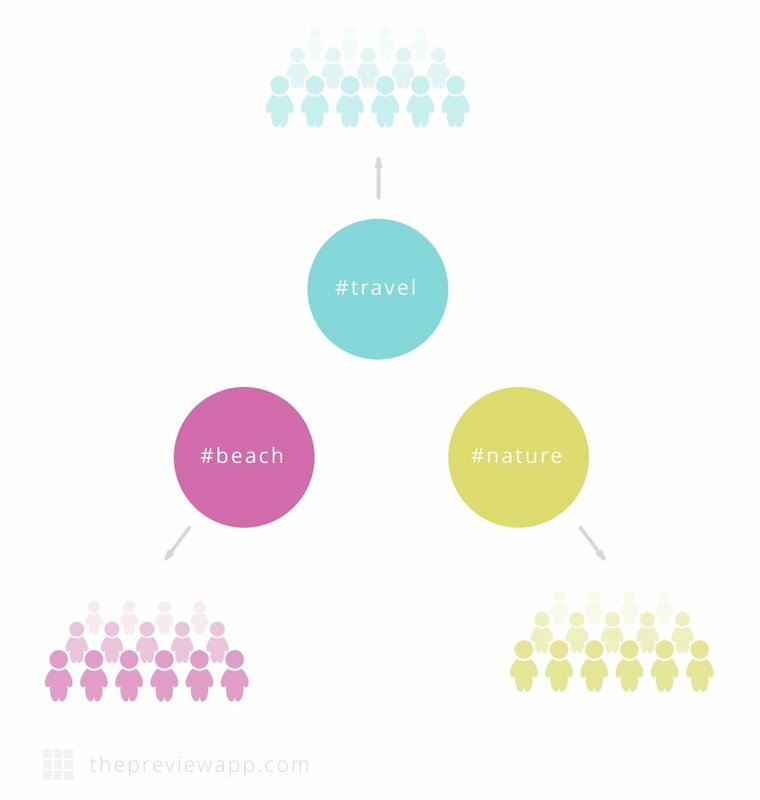 So if YOU and your ideal customer are using the same hashtags, Instagram could match you. It means that your posts might pop up in their Instagram feed. It means that your ideal audience will look at your posts! Some people like to use hashtags to organize their own posts. And that’s an awesome idea because people can click on your hashtag and see all your posts. Can you do the same for some of your content? Now, you have a good idea of what hashtags to use. Here’s the trick: mix the hashtags. You know how we tend to use the same hashtags all the time? We call this group of hashtags a “hashtag group”. Instead of typing or copying and pasting them on each post all the time, you can save them in Preview app. This way you can reuse them whenever you need them. You just have to press on the hashtag group to automatically add it in your caption. Quick tutorial: How to Save your Hashtag Groups in Preview app? Note: Cool thing about saving your hashtags in Preview is that the app automatically tests them for you. You’ll know which one gives you the most likes, comments and engagement. You’re putting so much work into your Instagram account. Know which hashtag works for you. You can see your best hashtags and best hashtag groups in Preview app. Preview tells you which hashtag gives you the most likes, comments and engagement. This is a new feature on Instagram. You can follow hashtags. When you follow a hashtag, posts from people (using that hashtag) will appear in your home feed. It is a great way to connect with new people. When you like and comment on their photos, they can discover your account too. Win-win situation! 14. Put hashtags in the comments or caption? If you put your hashtags in the caption, it makes it “heavy”, “bulky” or “not pretty”. So a lot of people started to put their hashtags in the comments to “hide” them and make their caption look “clean”. Instagram allows it. Your hashtags still work. But there’s a new rumour on Instagram. It says that the algorithm doesn’t like when people put their hashtags in the comments section. Is this true? I’m not sure. My advice: test it yourself. See if you get more engagement if you put the hashtags in the comments or caption. I personally put them in my caption now. Don’t use the same exact hashtags all the time. Keep them fresh. Instagram is a social media. So be social. Interact with others. Instagram loves interaction. So don’t just use hashtags and post. From time to time go on a hashtag page and take a few minutes to like and comment on people’s posts. People who use this hashtag might enjoy your account too! And finally, the last tip. I hate to break it to you, but I have to say it. None of the above tips matter if you don’t post quality content. Instagram is a visual platform. People will click on your post if it stands out. I hope this article was useful. Start by researching hashtags. Write them down and put them in groups of 30. Please let me know in the comments if you have any questions.